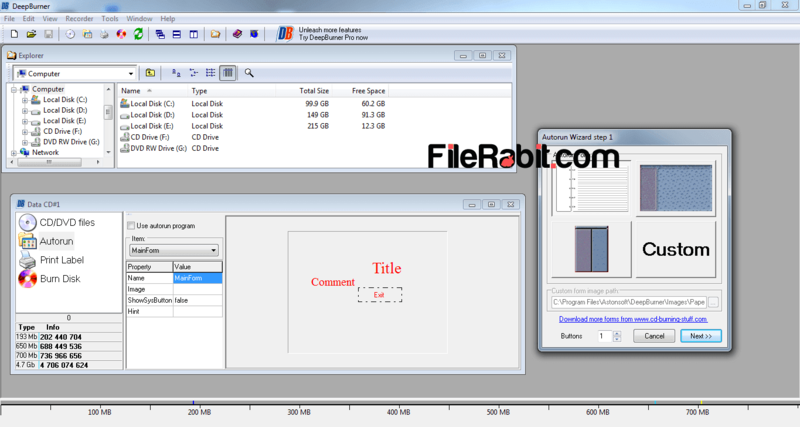 DeepBurner is useful tool to create bootable ISO discs, make data DVD discs with drag and drop support, add music files and burn audio CDs, save ISO files directly. Basically a powerful and professional disc handling software used to manage different files. Backing up important files and folders is most important project nowadays because every computer user is worry about important data. Deepburner lets you to create custom ISO disc images with adding images, software, office (word, excel, power point, access, notepad) files, video clips and audio files as well. 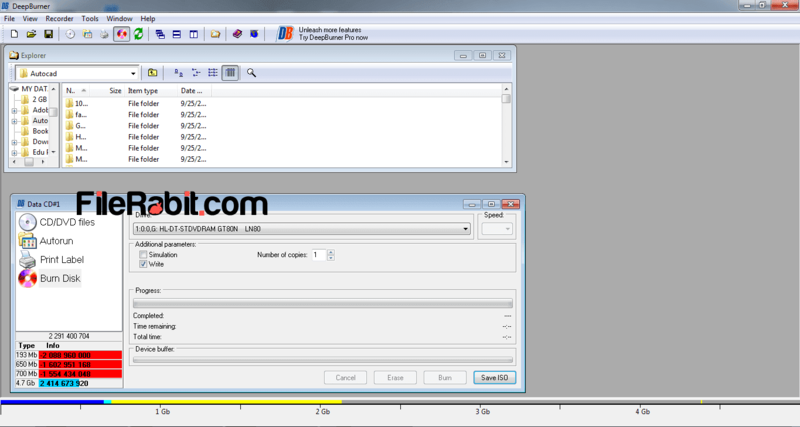 After creating custom ISO file, just burn into CD or DVD depending on the size of disc. The burning speed will also depend on DVD writer’s performance. However, create bootable and autorun based CD/DVD’s easily with adding target files in seconds. The layout of DeepBurner is simple that makes it easier to operate. There is no need to learn tutorials before burning or creating image files because its so easy and useful for beginners. The first time running will show 3 types of methods such as Create data CD/DVD, Create audio CD and Burn ISO image as well. A smart and light weight disc burning and ISO creating utility comparing to Nero Burning ROM. No doubt, Nero is extra professional but higher price will bring it out from reach of home users. DeepBurner will take very low Physical Memory and CPU Usage while performing any action including saving ISO, audio or data disc burning as well. However, DeepBurner Pro version has unlimited features especially in burning Audio/Video/Data disc’s, photo albums and DVD videos as well as DVD to DVD copy through disc image file. Track-at-Once (TAO) and Disc-at-Once (DAO) methods are supported for disc burning purposes. Furthermore, create bootable CDs/DVD’s with loading bootable file from custom destination. Many disc managing software will not let you creating bootable discs because they are offering just autorun feature. UltraISO, WinISO, Nero and Deamon Tools are professional tools but the higher price will make the difference. DeepBurner can easily create multiple copies of single ISO file to save user time. If you computer has multiple Disc Drives then you can burn multiple disc’s at once.